A cold germination test is used to evaluate the emergence of a seed lot in cold wet soils. Developed to simulate adverse field conditions, it is the most widely used vigor test for corn and soybean. Soil moisture sensors installed now can provide valuable information for dryland producers who want to determine existing soil moisture level and adjust cropping or planting plans accordingly. The authors installed and will be monitoring soil moisture readings at six sites in south central Nebraska. Researchers report on three years of field research in west central Nebraska where 4-14 insecticide treatments were tested under irrigated conditions. Research by Kansas State University on yield potential of drought-tolerant corn showed yields varied but often were equal to their non-DT counterparts. The advantage of the DT hybrids became more evident when the water stress increased to the point of leaves rolling most days. Achieving the most effective and consistent spray droplet size helps provide for precision application of pesticides, which saves input costs and reduces off-target movement. 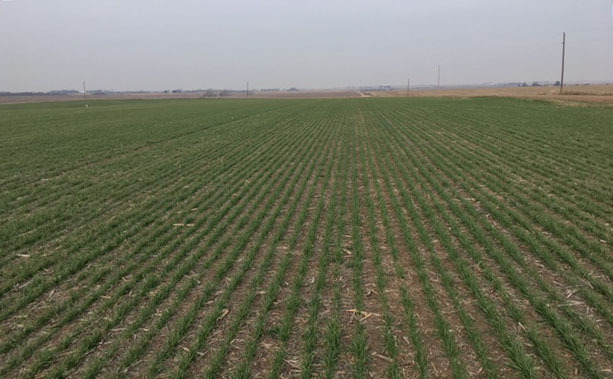 University researchers using a pulse-width modulation sprayer studied the best droplet size for effective weed control with six herbicides used in Nebraska crop production. University of Nebraska research is offering new insights into plant use efficiency of organic N resources such as livestock manure, municipal bio-solids, and others. The studies continue through 2018 and are expected to influence changes in university recommendations. The Soil Health Nexus is conducting a short survey to better understand your soil health challenges. Which benefits of soil health are most important to you? What practices do you use to improve soil health? Water quality? Sharing your insights can help them develop information resources to better meet your needs. Figure 1. To take care of your family and your livelihood amid a barrage of stressors, learn how to identify and manage stressors. Just as important as creating a weather resilient and financially resilient farm is creating a resilient farm family. As farmers and ranchers face stress, it's important to identify and manage the common stressors and model coping strategies for their families. North Platte River water operations and deliveries are expected to be normal for 2018, with no allocations expected, and an expected demand of 1.1 million acre-feet. Teams of youth interested in learning crop scouting and competing for cash prizes are encouraged to enter the 5th annual Crop Scouting Competition for Nebraska Youth. Teams are encouraged to form and register now for the July 26 event so they can start studies and preparations to compete.